These are seriously some of the best DJ’s in Austin. Everyone is doing a 30 minute set. I go on at 10:30pm. Wear your dancing feet. 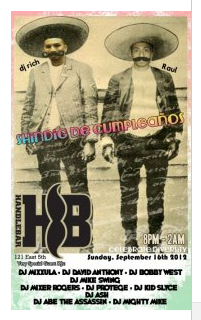 This entry was posted in Shows and tagged Austin, Cumpleanos, DJ, DJ Rich, Handlebar, Mixer, Party, Rogers, Shindig, TX. Bookmark the permalink.